Summer is over and it's time to get back to posting again. But I'm going to start the first few days with some pictures I shot recently in New Hampshire. 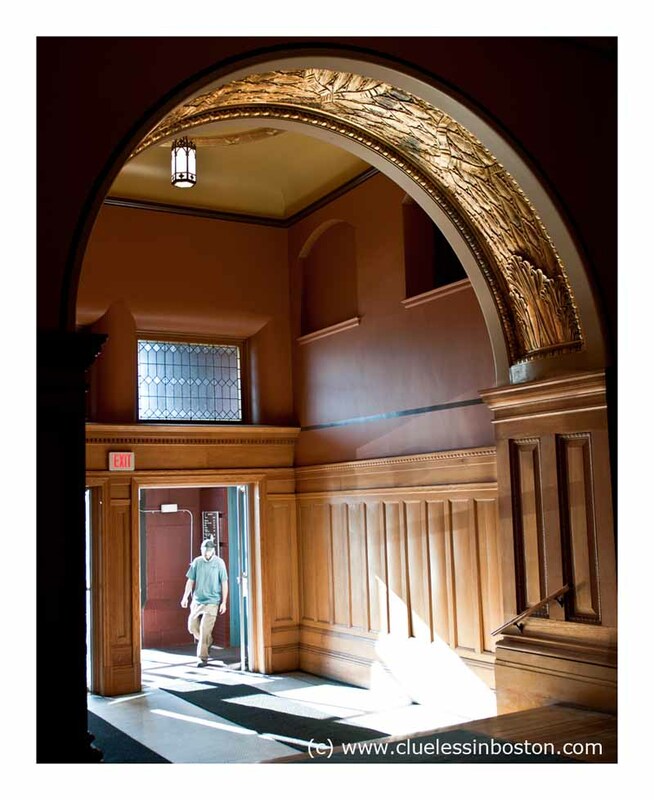 I found this beautiful doorway inside the Claremont, N.H. Town Hall, which is also its Opera House. Hello. It is nice to have you back. It is a beautiful doorway indeed. I like the idea of a Town Hall/Opera House. Woaw! what a majestic return! Welcome back! The arch and the carving is just wonderful. Super photo. Welcome back, what a fantastically ornate arch and brilliant return image! ah, you were close to b-boro during your summer travels, clueless. welcome back. Bonjour! So nice to see your beautiful pictures again!This doorway is magnificent, a very elegant door! Hello, how great that you're back posting again. I've missed you! This is such an elegant entrance. I've been trying to decide what the inside of the arch is - beaten metal, wood? It looks embossed so not just paint. Great entrance and entryway - beautiful craftsmanship! Welcome back. Sun makes beautiful pictures look even better. Welcome back! This is a quite an impressive doorway! So glad to see that you are back. Yay! Welcome back. Hope you had a super holiday. There is so much to like in this photo! I love the detail on the inside of the arch. Good to see you back! I love the old doorways in New England. It is good to see you back. Great photo, lovely place. Are you going to tell your viewers that Claremont is the home of Carlton Fisk, Beantown Hall of Fame catcher? So glad to see you came back - Thanks! So good to see you back with this interesting doorway. It has light, action, texture, architecture... and beautiful wood. The light on the arch drew me in and then the man coming through the door led my eye there. A lovely photograph.